Norman Jaffe’s iconic Long Island houses were designed in the 1970s and ’80s, when the island’s East End went from a beach getaway of primarily small, nonwinterized summer bungalows to a posh resort of gigantic, ostentatious mansions. Though Jaffe was displeased with the change, it’s hard not to think his houses unwittingly anticipated or precipitated the shift. Along with Andrew Geller and Horace Gifford, Jaffe made the island a leading location for experimental architecture. His material palette of weathered wood, taken from the farmhouses of the area, along with his bold, striking forms, created the Hamptons look. The literal flatness of the island and its extraordinary quality of light, bouncing off the surrounding sea, provided the perfect tableaux for a holiday architecture that wanted to stand out and be seen. By the time Jaffe drowned swimming off of a Hampton beach in 1993, he had designed more than 50 houses on Long Island. While some have been torn down, there are still dozens that dot the region and are beloved and carefully maintained by their owners. In 2014, his Schlachter beach house in Bridgehampton was restored by a respectful owner. More recently, Jaffe’s own 1986 house has received a careful modernization that shows perfectly how to update and at the same time improve an iconic work of architecture. Nick Martin of Martin Architects, a Hamptons-based architect and builder, found the house for a client and set to work redesigning and restoring it. The original residence was a single structure, but over time, Jaffe added three additional outbuildings surrounding a swimming pool, like so many other farm compounds on Long Island. Martin removed a seldom-used second-floor balcony in the main house, merged the space into a new master bedroom, enlarged the living room by joining it with the original foyer, and added new public and private entry points on a north/south axis with the pool. 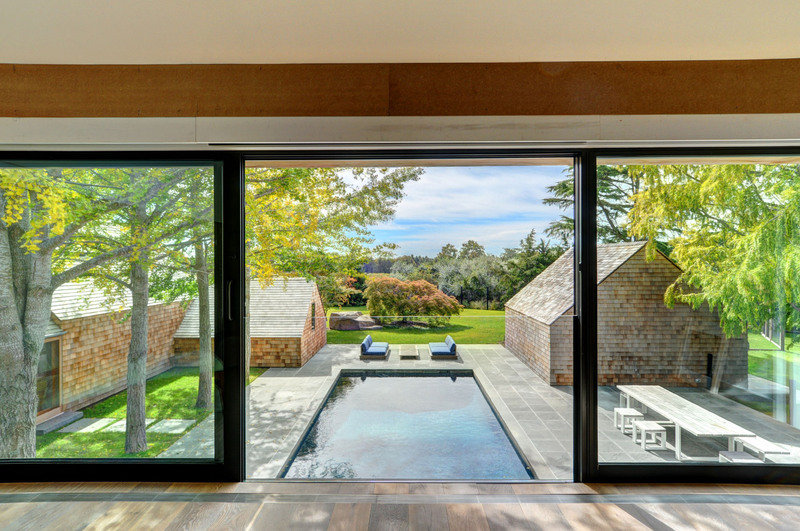 In order to capture the special light of the Hamptons, he dramatically enlarged the windows facing the swimming pool courtyard. As in most modernizations of older houses, the kitchen and bathroom received the most upgrades. The house is now the definition of the perfect Hamptons summer home in 2018. Its striking shingled facade, with a large sloping roof and prominent central chimney cleared of an overgrown pergola, now stands out without overwhelming its site, as so many contemporary Hampton houses do today. A bespoke aluminum building skin transforms an abandoned war bunker into a high-performing boutique hotel. Restoration hotelier Unlisted Collection recently acquired a historically listed, vacant municipal building in London’s East End that served as a set favorite for film luminaries like David Lynch. The 1910 Edwardian fore building and its utilitarian 1937 addition had served as the town hall of Bethnal Green before World War II. In order to convert the complex into a boutique hotel, Unlisted hired London-based architecture practice Rare and tasked the firm with designing an addition to the existing buildings to add space for more guest rooms and amenities, while unifying the three disparate elements into a single entity. Rare directors and founders Nathalie Rozencwajg and Michel da Costa Gonçalves answered this last charge with an ornamental screen facade that visually ties together the historic and modern buildings while also improving user comfort and environmental performance. “The yellow brick facade of the 1937 building wasn’t finished due to the outbreak of the Second World War, when it was repurposed as a bunker,” Rozencwajg recently told AN. Since the building had suffered no major damage during the war, the designers had to move forward while abiding by the English heritage guidelines for preserving historical structures, including the decorative Eduardian facade along the street front. To expand square footage and enable the building’s function as a hotel, the team designed a fourth-level add-on for additional guest rooms. The addition is enclosed in a double-glazed curtain wall that is screened by a parametrically designed ornamental skin. 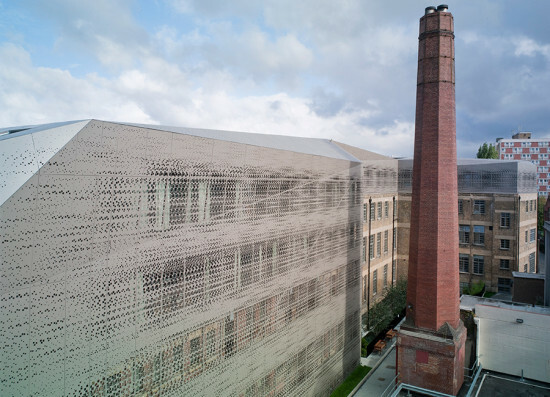 Working in a custom-scripted plugin for Rhino, the team designed a pattern for the screen wall derived from an old ventilation grill that they found in the 1937 extension. In developing the pattern, the designers divided the project into three major zones. The uppermost level functions as a brise soleil with a tightly defined pattern that blocks most of the southern sunlight that impacts this part of the building. Toward the center, the pattern is varied, more open in some places and more closed in others to accommodate interior programming—guest rooms feature smaller apertures for greater privacy while the public spaces are clad in a more open screen. At the bottom level, apertures are kept small to provide privacy from street-level passersby. Approximately 980 feet of the building’s surface is wrapped in this screen, fabricated from laser-cut, 4-mm-thick aluminum sheets. Eight 7-by-4-foot panels in varying pattern densities are bolted into a frame that hangs from the curtain wall. At the roof level, the panels were designed to conceal the building’s elevator towers, plenum, and pitched roof profiles. Rozencwajg estimated that unique panel shapes make up 30 percent of the screen system. Each panel was numbered for efficient installation and bolts in each of the panels’ four corners prevent damage from wind and other environmental factors. The modularity of the panel system also provides for future design flexibility. “If you rearrange the space internally and want to reconfigure the facade, you can change out the panels for more or less opacity,” said Rozencwajg. The panels are finished with a metallic powdercoat that changes hue based on the sun’s angle. Since the historical listing prohibited the architects from altering the existing building—including the old sash windows—the new curtain wall had to improve overall building performance. The south elevation features double glazing to minimize heat gain and natural ventilation is enhanced with trickle vents and energy-efficient windows on the new level. The combined efforts resulted in a BREAM rating of Very Good.